It doesn't sound like much, but putting together these clues allowed the firm to guess what the reporter was writing his story about (which nobody knew but him), as well as the phone numbers for some of his confidential sources. Yikes! They were able to achieve all this because the reporter did willingly ask them to spy, and allowed them to install a small box on his home router that would aid in their spying operation. Despite this being a special case (most of us are not at risk of someone walking into our homes and attaching black boxes to our routers), it's still surprising how much they were able to find out. You may very well be safe at home, but when you leave your home and connect to a public wifi hotspot, that's a totally different story. You have no idea whether the router at the local coffee shop has been malevolently (if unknowingly) compromised. Sure you can follow the advice to never do any banking or shopping when connected to a public system, but given the story above, it sounds like you really are at risk even if you don't give up your bank account info. That’s why I’m glad I use Cloak. Cloak is the name of an app and VPN server provider. Today's reality is that what you do online is absolutely not private. And even if you don't have anything to hide, people with bad intent can learn a lot about you from your average daily web browsing habits. As I said above, check out the Project Eavesdrop episode of Planet Money I mentioned above. VPN stands for Virtual Private Network. In simple terms, Cloak is active, your computer first forms an encrypted connection to their VPN server, and then that VPN server connects out to the broader internet. If you've ever worked for a company that provides a laptop, you've probably used a VPN server for a long time. However, now it is clear that not just employees need to protect themselves when they go on the internet. This all happens seamlessly behind the scenes, and with impressive speed. But the advantage is that all of your traffic is now encrypted, making it much, much more difficult for someone to intercept anything you type into your computer and send out over the internet (like credit card numbers or bank passwords). The Cloak app (available for iOS and Mac OSX) runs in the background- any time you are connected to one of your trusted WiFi networks, Cloak just chills. But the second you connect to a network that is not on your trusted list, Cloak springs into action and connects you through a VPN server. It even does this seamlessly on iOS. You don't have to mess with VPN settings ever. 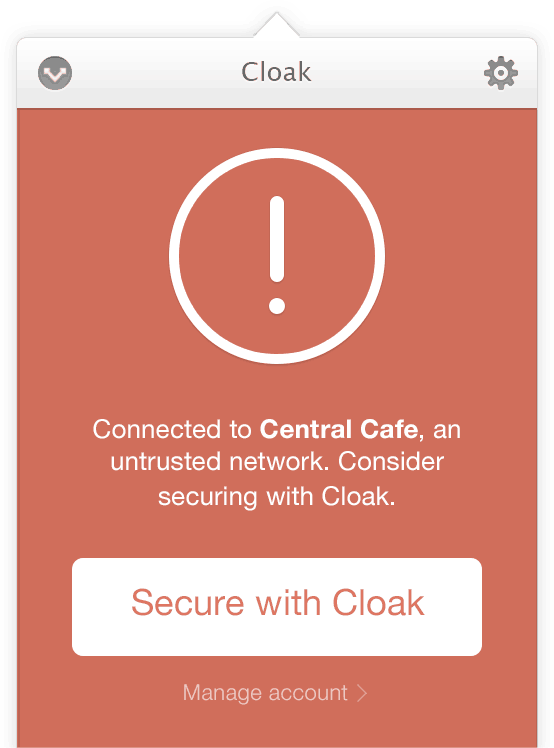 If you frequently work from coffee shops, airports, or even just use the neighbors wifi without them knowing about it, I'd suggest trying out Cloak. It’s simple and foolproof, and best of all: inexpensive. I'm currently on a plan that costs $3.99 per month. You can start and stop it at any time (so you could just sign up for a month that you plan to be traveling). They even offer a 30 day free trial, so you've really got nothing to lose. Unfortunately, Cloak is only available for those who are already into the Apple ecosystem. They only make apps for Mac and iOS, so if you use Windows and Android, you'll have to find something else. If you're looking for a Windows alternative, SpotFlux looks promising- and even offers a speed-limited free plan. If you had asked me a year ago whether or not you needed to use a VPN server, I would have said no. So much has come to light in the past year about the (in)security of our data when we use the internet, that I have reconsidered how safe I really am. What about you? Do you take any extra measures to secure yourself online? Note: I am in no way affiliated with Cloak and do not receive any kind of incentive if you sign up. I just like it that much.